I'm new to the group, and thought I'd send my introduction. My name is Emma, and I have two kids, Ivy (age 3) and Max (8 months). I've been plagued with supply problems with both kids. Both were born at home, and nursed from birth (yay!). But I never had enough milk. Poor Ivy-- she nursed _all_ the time. We did the family bed thing. It didn't help. At 4 months, she looked like little Auschwitz baby (I didn't have a normally fed baby to compare her to). My mom had nursed me for 2 1/2 years, so I always expected that I should be able to do the same, and looked forward to it! Giving Ivy formula was really hard for me - it felt like I'd failed. I'd always thought formula was evil. One day, in my pediatrician's office, I happened to run into an LLL leader I knew. She looked at Ivy and said I should remember that formula is not bad if you think of it like medicine - it's there for us to use when necessary. That advice helped me a lot. Other advice was less than useful - mostly just "doctors always say that women don't have enough milk. It's a myth. You're just not trying hard enough. Try XYZ." I imagined there was some chemical switch in my body that was turned off - if only I could trigger it, I could gush with milk! I cried when I first started supplementing her (we used soy formula). I'd tried so hard! I'd worked with a lactation consultant, made nasty tasting teas to stimulate milk production, pumped (I bought a pump in style), you name it! But at 4 months, Ivy just needed more than I could provide. We used a haberman feeder, because my lactation consultant said she was too old for an SNS (she'd just play with it instead of nursing). Once we started supplementing, she stopped crying so much, slept better, and plumped right up. She'd been hungry! Poor baby, I'd let her suffer so. She weaned completely around 10 or 11 months (at which point I was really only nursing her to sleep). Today she's a happy, healthy, rambunctious 3 year old. The second time around I was prepared. Everyone I had talked to about supply problems, said that their issues had gone away with the birth of their second child. I was so hopeful! And then so disappointed. With Max, I pumped early on (after each feeding), hoping to stimulate more production. But sure enough, he wasn't gaining well. This time, we started supplementing early on. We didn't wait for him to get so incredibly skinny. He had trouble going back and forth from bottle to breast until I switched to the Avent bottles- they worked much better. I tried the haberman with him, but it didn't seem to help his sucking, so we stuck with the Avents. Those were much easier to clean & use, anyway! I tried fenugreek, blessed thistle, and alfalfa, but got sick of taking SO many pills (5 total 3x a day, plus my prenatal vitamins, 6 a day. blech!). I also found that the fenugreek seemed to aggravate my tendency towards asthma. Whenever I did much physical activity, I'd be coughing and wheezing. I discontinued the herbs, and the problem became less severe. I didn't get much help from My mom or my sister, either. I was adamant about limiting Max's formula in the beginning, because if he was hungry, I wanted him to nurse FIRST. They didn't get it. Eventually, we found a happy medium (well, after I went back to work and had no more say in the matter). After researching online, I found out about reglan and domperidone. I got a recommendation for a doctor who had a lot of experience with breastfeeding, and drove out (an hour away!) to see him. Why did I waste my time? He confirmed that I was already doing everything I could. He said that it's a myth that all mammals produce the same. In the case of dairy cows, if they don't produce, we turn them into hamburger (of course, we don't do that to people, he said). Not much comfort there, and I didn't appreciate the allusion. He gave me a prescription for reglan (which I didn't fill) and suggested that I just try again with the next baby. Grrr. So I ordered domperidone from Pharmacycare in New Zealand. (BTW, even though their website is shut down, they're still in business. I've been able to order refills regularly via email). I've been taking that, and I think it's kept my supply from drying up, now that I'm back at work full time and pump on an erratic schedule. Speaking of work, I went back when Max was 3 months old (My husband is a SAHD. I stayed home until Ivy was 1, then we switched). When I first came back, I was able to pump 3-4 times a day, and got 4-7 ounces (total). Now I'm lucky if I can get away to pump twice a day, and I get about 2-3 ounces. He nurses at night, and lately has been nursing better, so that's a comfort. When he's fully awake, unless he's very hungry, he won't nurse. I try taking him in the bedroom to lie down together to nurse, and that helps a lot. If he's hungry, he'll do it then. Since Max has started solid food, I've been mellowing out about nursing, and stopped trying every milk-stimulating herb and food out there. He still sleeps with us, which I am adamant about. If he only nurses at night, then he stays with us until HE chooses to wean. Period. I am not putting him in the crib before then. (Can you tell my husband and I have argued about this? He wants me to get more sleep, so at least his heart is in the right place, even if he doesn't understand how important nursing is to me. So now he sleeps on the floor in a sleeping bag). Anyway, I was thrilled to learn about this group! Finally, other people who understand how important nursing is to a woman, and how hard it is not to be able to. Who won't make me feel guilty about using formula. Who know that sometimes, even if you try your hardest, it just isn't to be. The nursing books dedicate about 2 lines to say "If you are one of the few women who truly can't nurse, don't feel bad. You tried." Not enough comfort for me. So I'm glad to finally find a resource for the rest of us. Thanks for listening to my story! 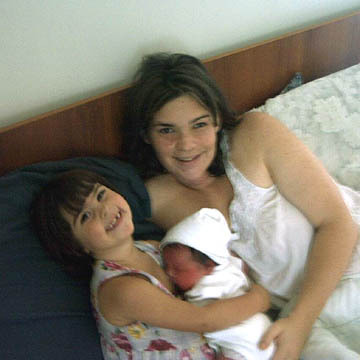 You can see a picture of Me, Ivy and Max on the day Max was born.